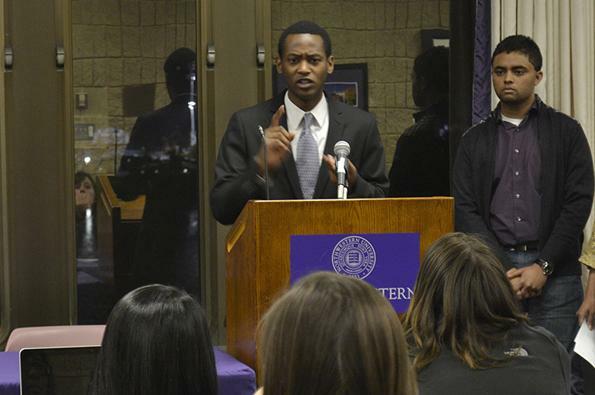 Medill-Bienen sophomore Thaddeus Tukes answers questions from Associated Student Government senators. Tukes was confirmed unanimously Wednesday night as ASG’s associate vice president for diversity and inclusion. Associated Student Government Senate unanimously approved sophomore Thaddeus Tukes at its meeting Wednesday as associate vice president of diversity and inclusion, a position that has been vacant since Spring Quarter. 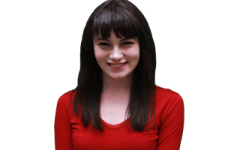 Last year, ASG made two failed attempts to fill the position left vacant by Hayley Stevens (Weinberg ‘13) in May. The ASG executive board “revamped” the position this fall, president Ani Ajith said. Although Tukes said he found out the position was open only the night before the application was due, the Medill-Bienen dual degree student expressed his enthusiasm for the role during his speech to Senate on Wednesday. In his introduction of Tukes, Ajith, a Weinberg senior and former Daily staffer, said the position is not meant to assist only minority groups. “The position is supposed to serve all students on campus, not just students that look like me,” Ajith said. Tukes said he wanted to clarify that diversity is a very broad term and said many groups on campus are minorities, including music students and students in Greek organizations. “It’s not just race or gender,” he said. As the only Northwestern student studying both jazz and journalism, Tukes said he knows firsthand about being a minority. He also said his work for Pulse magazine and for his own band have prepared him for his new position. “A lot of what I’m doing as vice president of diversity and inclusion are things that I do every day, just on a smaller scale,” he said. Tukes said he is prepared for the challenges the position presents.